Let's say I'm working on a software library in which certain unit tests rely on GPL licensed code but the code that a user of this library would install on their system does not interact with GPL licensed code. Do I still have to licence all of the library's code under the GPL? Or can I provide separate licences for my tests and the rest of my code? If someone who clones my project repository builds the tests (which is optional), the tests are linked against a GPL (without library exception) licensed shared library as runtime. This is the only part of my library that uses GPL'd software in any way. I'm uncertain whether this makes the whole library fall under the GPL because the tests are distributed as part of the same project. Merely using GPL-covered software is perfectly fine under any circumstance. The question is whether software that you wrote is also covered by the GPL. This is the case whenever it is a derivative work of GPL-covered software as defined by copyright law, in particular if the software that you distribute is a modified version of GPL-covered software or if your software includes GPL-covered code. Clearly, the library source code is not a derivative work of the GPL-covered library. Therefore, you cannot be forced to release the library source code or binaries of the library under the GPL. Similarly, the source code of the tests is (likely) not derivative of the GPL-covered library. However, the runnable tests are probably derivative of the GPL-covered library. Under the terms of the GPL, the source code of your runnable tests must be made available in compliance with the GPL, in particular under a GPL-compatible license. The source code of the tests includes the library's source code. You are not required to publish your tests. If you publish the tests in source form or other form, you must make the source code of the runnable tests under a GPL-compatible license. The source code of the tests includes the source code of your main library. You can choose different licenses for the libraries and the tests, as long as all licenses are compatible with each other. While the license that you choose has to be GPL-compatible, it does not have to be the GPL itself. For example, you could choose the MIT license instead. This should not be a problem for most open source libraries. There are some niche cases where there would be problems. For example, if you publish the library incl. tests under a license that is not GPL-compatible. 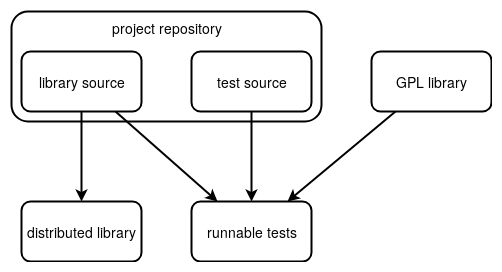 Another scenario would be a proprietary software project where you do not intend to share the tests at all, but would later like to license your test suite to a client. This would imply a license of the main library to the client under a GPL-compatible license. Note that the set of GPL-compatible licenses depends on the exact GPL version. In particular, the Apache 2 license is compatible with GPLv3 but not GPLv2. See the FSF license list for various licenses and the FSF's thoughts on GPL compatibility. Merely using software in the course of creating other software doesn't make it a derivative work. Otherwise, you would be subject to the licenses of even things like the operating system your compiler ran on! You can safely license your code separately from your tests. In fact, depending on the details, it's possible you may not even need to GPL license your tests. For example, if you do not distribute your tests, they wouldn't need to be GPL licensed. Can I use a proprietary library in my GPL'd program? Using GPL library in unit test suite of open source library?